Lexus has released a new commercial filled with its all new LC500's V8 engine sounds. 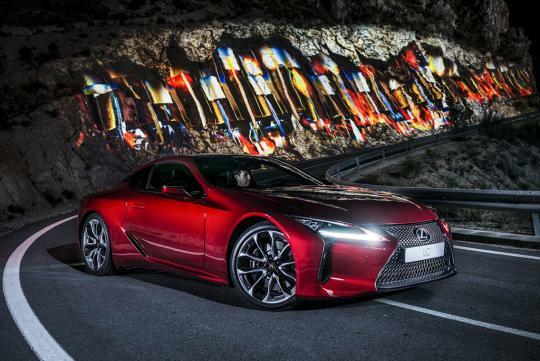 Shot in the Spanish Sierra Nevada mountain range, the new short clip shows the sleek LC500 being driven on a beautiful road at night, with filmmakers using real projectors to portray some very impressive imagery on the huge rock walls along the road. To make sure the videos they want to project on the rock walls turn out well, they had to bring together four of the brightest projectors in the world and link them together for a seamless backdrop of images moving over the mountainside. For those of you who are wondering what resides under that bonnet, a 467bhp naturally-aspirated V8 sits there and is paired to a 10-speed automatic gearbox. I am a university student doing a project and need opinions from car enthusiasts. I wanted to ask you on your opinion about the Lexus brand. Is'it possible to contact you via email?